The past three #NewMusicFridays have offered up some stellar stuff, including four albums I'm putting on my list as 'The Best of 2016 (So Far)'. That's some big shoes to fill. Last week saw an important anniversary in Janet Jackson's Control turning 30 (so make sure you do your homework and listen to the whole record). Also, if you didn't watch Grease! Live! on FOX (aka Vanessa Hudgens real star-making moment), you were missing out. Read on for all the tea in terms of what I've been listening to for the past three weeks. ...but you can't keep a good Popstar Lying in Wait down. Her debut "Hide Away" gave her the Billboard / radio hit spotlight. "Don't Let Me Down" proves she has genre-bending staying power. RIP, Maurice White. 2016, stop taking our legends. Listen and try not jamming out to those funky horns. Reminder that Grimes kills, maims, and slays. Foxes's excellent All I Need album is exactly that. It's full of great, catchy pop song-writing and solid vocal performance. Lyrically, "Scar" stands apart as my current favorite. Theme Song for 2016. Theme Song for Life. This cutey played a small role in Grease! but was snatching up hearts like he belonged in a boy band with his cute glasses and guitar playing. Don't let the cover art fool you. This is a legit, no-nonsense, R&B midtempo. The former member of M2M offered up a great solo record at the end of January. It's worth a listen from front to back. Do not -- I repeat -- do not write these fellas off as one-trick ponies. Yes, they are the team that brought us the earwormy "Hold On, We're Going Home" with Drake but their debut self-titled album is everything I never expected it to be. Not a bad tune in the entire bunch. And in 2016 that's saying something. A feminist anthem in pop clothing is my favorite kind of feminist anthem. And also, thank God it's not 1954. ANTI's roll out remains a stain on Rihanna's career but "Desperado" is easily my favorite of the set. Speaking of, Sia released This Is Acting the same week ANTI dropped, featuring a handful of cuts she wrote for said Rihanna project that were rejected. One such track was allegedly "Cheap Thrills" which I will hereby state is 1000x more fun than anything on ANTI. Yup, I said it. This Is Acting has a lot of high points going for it in addition to "Thrills" -- my other faves being "Unstoppable" (written for Demi? or maybe Katy? ), "Bird Set Free" (demoed by Adele), and "Move Your Body" (meant for Shakira?). 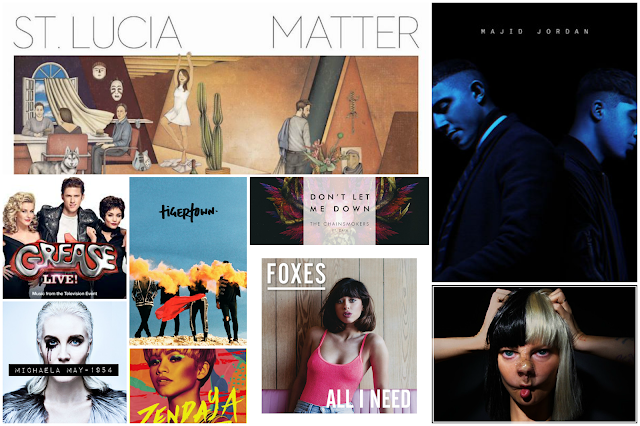 Matter is an early favorite for Album of the Year. Putting this album on means instant smiles and happy vibes. One of those jams that is lyrically sad but the tempo convinces you to be happy. A bonafide hit on the Hot 100, it reminds me more of those late 90's/early 00's radio hits that were both relatable and sad. Perhaps its the old-twentysomething in me. What's to be said here that hasn't already been said? She was properly amazing as Rizzo and earned a legion of fresh fans for the right reasons. Good on you, Vanessa. CrazySexyCool TLC aesthetic is all up in this with a strong interpolation of "Creep". As much as I love this sound (and song) for Zendaya, it does lose major points for having Chris Brown on the feature. Why is he doing so many feature spots with vibe gals with potential? You're trying to tell me there was nobody else available for this? Get out of here. Sigh. Patiently waiting for the non-CB version, thanks.